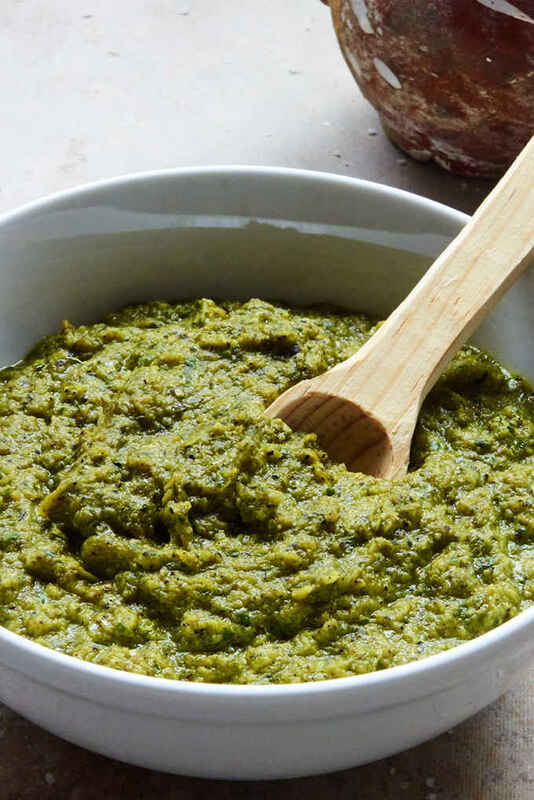 Looking for a bold salsa that packs some heat? Well then, our pan roasted jalapeño salsa is what you are looking for. The peppery flavor of the jalapeños is front and center. 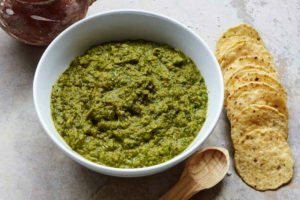 Unlike most salsas where the chile peppers are added to a base of tomatoes or tomatillos, jalapeño peppers are the base of this salsa which gives it its distinct taste and extra heat. Gather your ingredients. 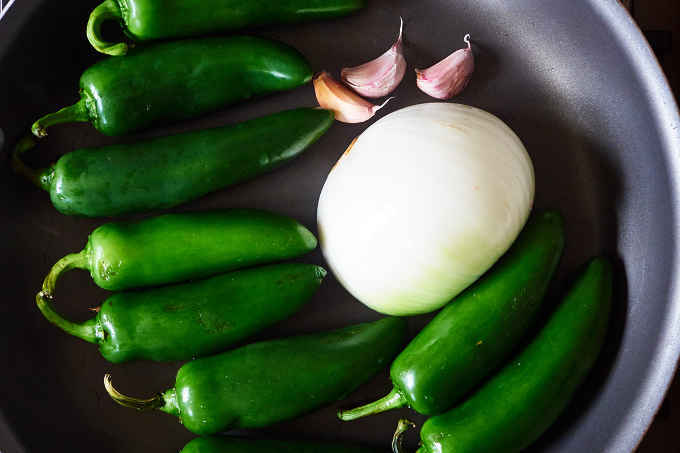 You will need the following: 9 large jalapeño peppers, 1/2 large white onion, 3 cloves of garlic, 2 limes, 12 sprigs of cilantro, 2 tbsp cooking oil, and 1 tsp+ salt. The 1st step is to blacken the jalapeños, onion, and garlic. Blackening adds flavor. You want to get the peppers really black. Pan roast them in a dry pan for about 20 minutes. Leave the husks on the garlic. After you have blackened the pepper, onion, and garlic cut the stems off of the jalapeños and place them in your blender. Remove the garlic cloves from their husks and add to your blender. Add the onion, cilantro, juice of 2 limes, 1/4 cup of water, and 1 tsp salt. Blend for 30 seconds. The salsa should have some texture and body. Frying the salsa in hot oil deepens and intensifies the flavor. Heat 2 tbsp of cooking oil to medium hot in the same pan that you roasted the jalapeños. Pour the blended salsa into the hot oil. This is called “seasoning” the salsa. After 1 minute, reduce the heat to low and simmer for 15 minutes. Allow the salsa to cool and serve. Try it with carne asada, chicken tostadas, or quesadillas. Give it a try. Provecho! Intensely flavored pan roasted jalapeño salsa which packs some heat. 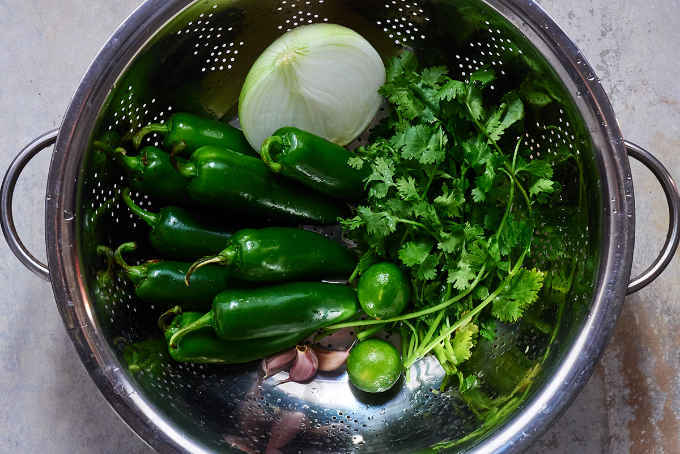 The peppery flavor of the jalapeños is front and center and enhanced by onion, garlic, cilantro and lime juice. It's easy to make and a great addition to your salsa repertoire. Heat a dry pan to medium hot and add the jalapeños, onion, and garlic. Cook until the peppers are completely blackened, about 20 minutes. Remove from the pan. Cut the stems off of the jalapeños and place them in your blender. 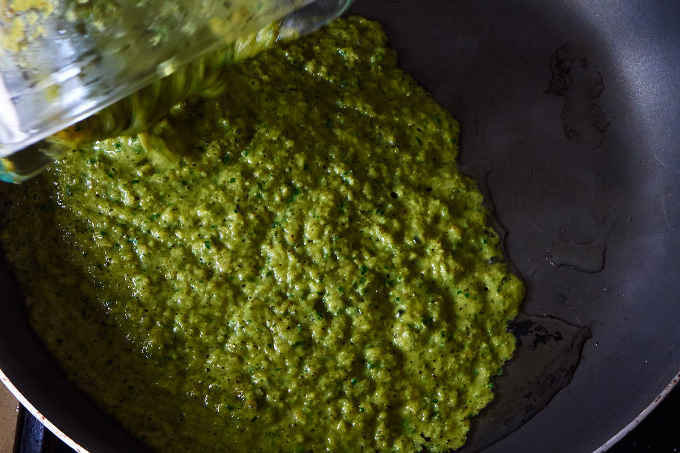 Remove the garlic cloves from their husks and add to your blender. Add the onion and cilantro, 1/4 cup of water, lime juice, and 1 tsp. salt. Heat 2 tbsp of cooking oil to medium hot in the same pan that you roasted the jalapeños. Pour the blended salsa into the hot oil. This step is called "seasoning" the salsa. After 1 minute in the hot oil, reduce the heat to low and simmer for 15 minutes. This deepens and intensifies the flavor. After 15 minutes, take and adjust the salt if needed. 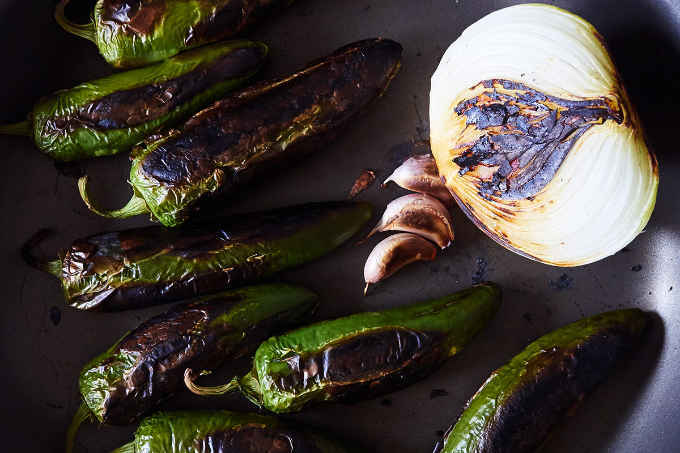 You can also oven roast the jalapeños. Place them on a baking sheet lined with aluminum foil and then cook them for approximately 30 minutes turning once. Hello. This recipe looks so good! Can it be canned, do you think? Would I need to add vinegar or would the lime be enough acidity?